Can a cupcake be savoury? 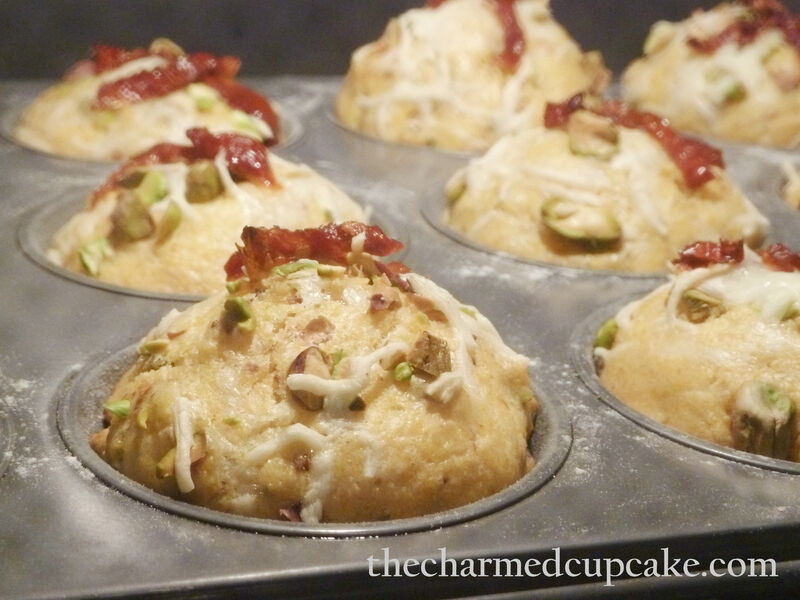 or would it be called a muffin even if it’s baked in a cupcake pan? but it has ‘frosting’ (a savoury frosting) so you can call it a cupcake or? 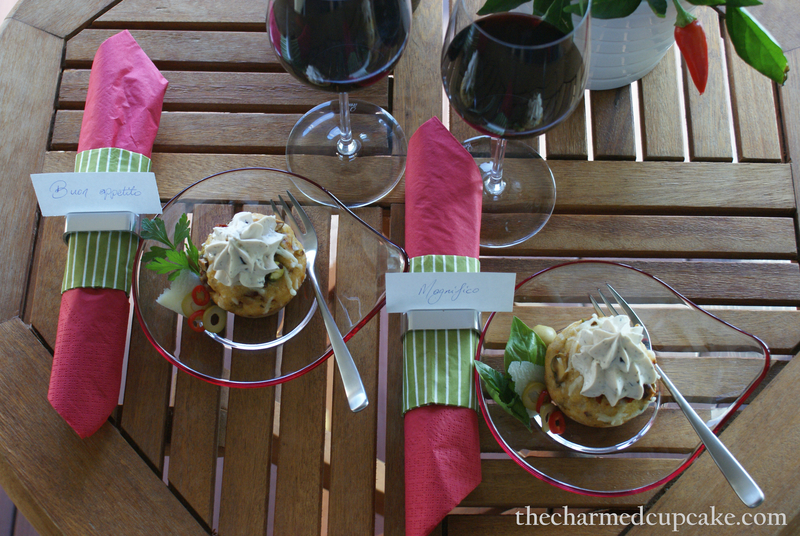 It’s a debatable topic but I like to call The Home Bakers 8th bake ‘Sun-Dried Tomato-Pistachio Polenta Cupcakes with Olive Cream Cheese Frosting’. 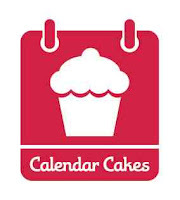 This is a monthly baking event organised by Joyce from Kitchen Flavours where the members all bake from the same book – “Coffee Cakes” by Lou Seibert Pappas – until every recipe has been baked from this book. This recipe is filed under the ‘savory picnic cakes’ section of the book and it was selected by Yvette from My Worldwide Culinary Adventure. You can find the detailed recipe here on her site. Beat the cream cheese then beat in the olive paste. Add salt and pepper to taste and frost/spread as desired. This is the first time I have baked a savoury cake, at first I was a bit apprehensive but then it had all my favourite ingredients – sun-dried tomatoes, pistachio and polenta – so I couldn’t pass up this bake. 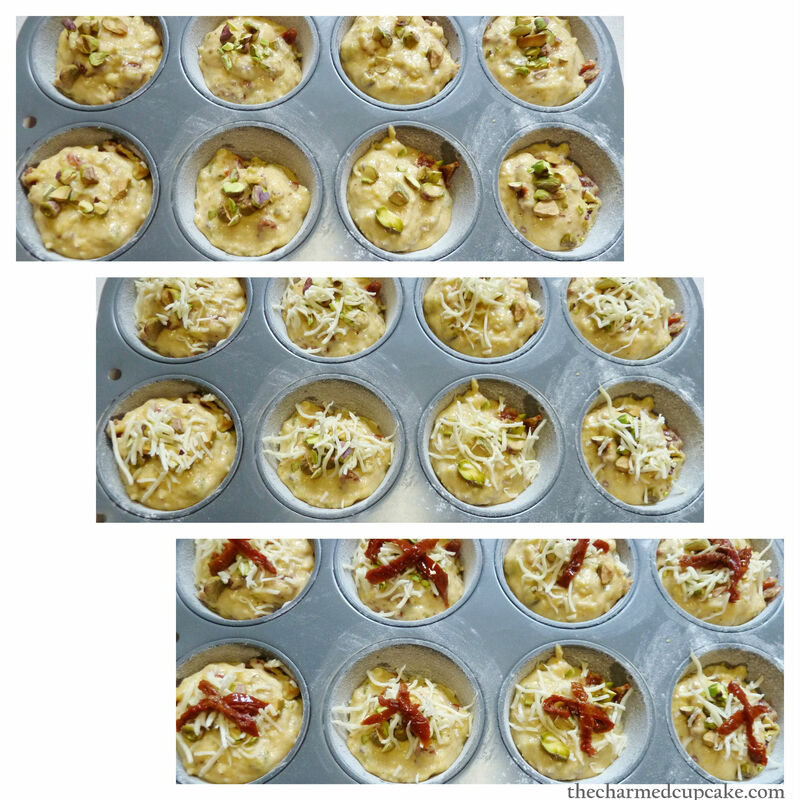 The polenta gave it that grainy texture, the sun-dried tomatoes and Parmesan cheese gave it a distinct Italian flavour and the pistachio nuts gave it that nice crunch. I have to admit this cake was best eaten fresh out of the oven or warmed up as I found it slightly dry when eaten cold. Hence my addition of the olive cream cheese which matched it perfectly. Lou Seibert Pappas – the author of the recipe book – does state that this cake is ‘an ideal complement to a Caesar salad or a lentil or bean soup for a light meal’. But we had it as an afternoon snack whilst trying to catch the last of the summer sun here in Austria. 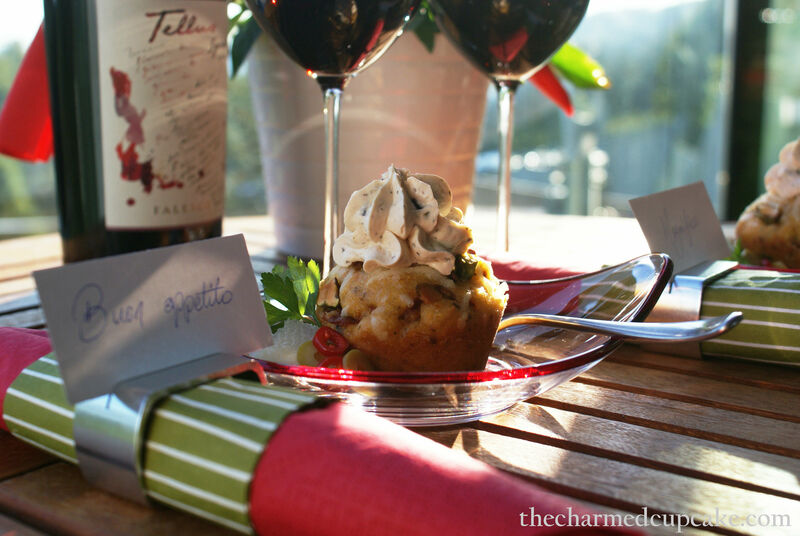 So instead of afternoon tea, we did as the Italians would and enjoyed a good drop of Italian red wine with a savoury cupcake in hand. 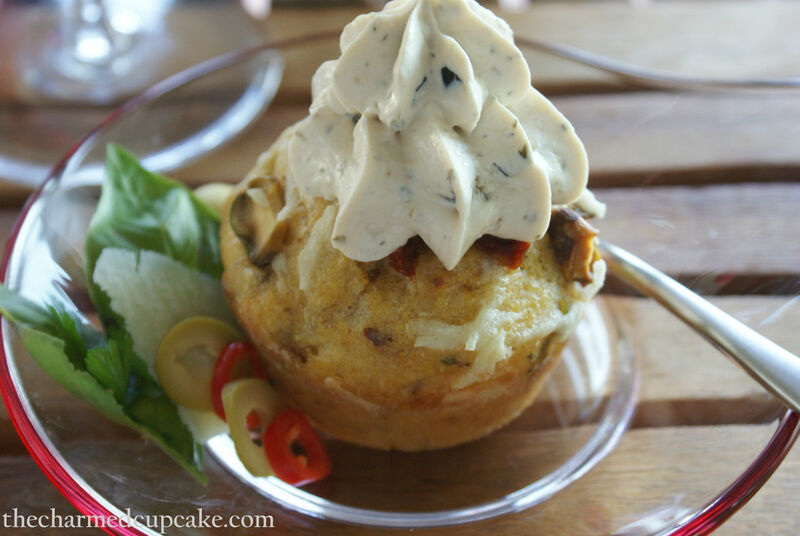 So would you call these a savoury cupcake? National Cupcake Week, 17 – 24 September 2012.
oh wow another award?!?! Thank you 🙂 and congrats to you too. I would love a bite of that! 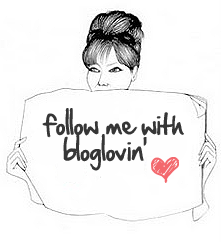 You have a lovely blog by the way! Your savory cupcakes sound good. I really like the idea of the olive cream cheese frosting…very clever. hi angela, me too made this kind of savoury cake for the first time. It is a superb idea to frost it with some cream cheese, add moisture to the cake and cream cheese..just love it! Yeah the friends who sampled this bake also agreed the cake was a bit dry. I might add more oil next time I bake this as polenta does absorb a lot of liquid. The olive cream cheese did go very well with it. You are SO getting me into the idea of cupcakes, for the first time. This savoury version would be perfect! I would definitely call that a savory cupcake! Looks delicious! 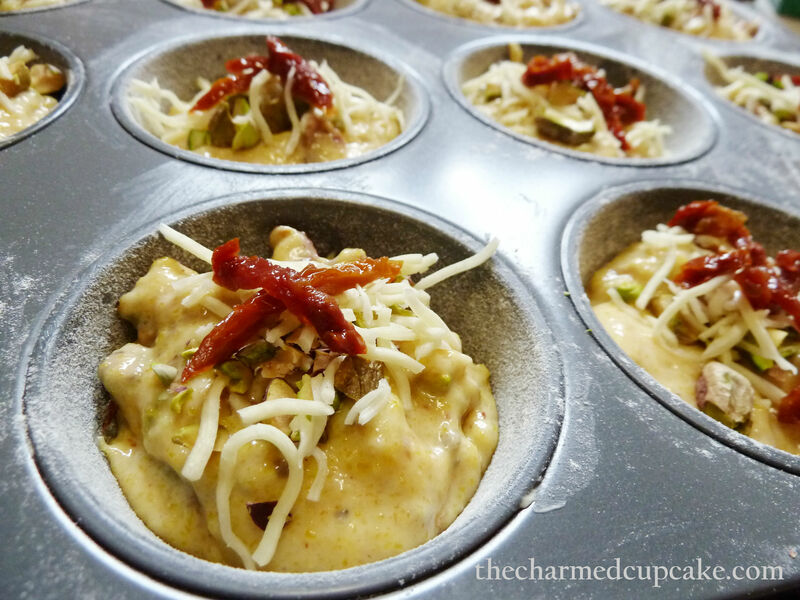 If you want to try more savory cupcakes, you should check out Cupcake Project, she makes them all the time! This is brilliant! A savory cupcake with a savory frosting. I can just taste the flavors in my mouth right now. It looks magnificent! 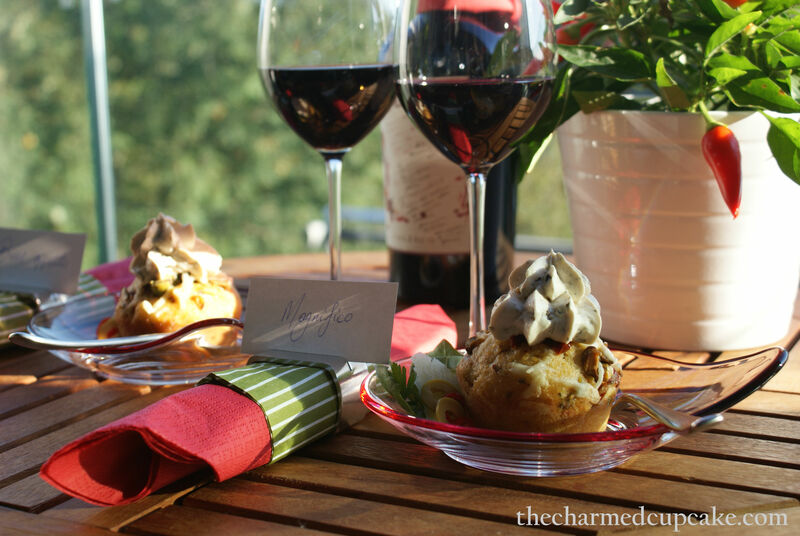 And with a glass of red wine–what a way to enjoy an afternoon snack! I love the cream cheese topping so much! Never thought of adding olives to my cream cheese for a savoury treat, will do that next time! You have made a delicious looking adaptation to this savoury bake! A great idea with the cream cheese topping! That’s a lovely setting, a glass of wine, oh yum and love your cute little plate! I love this – the recipe is so inventive and creative and the photos are great! Lovely!! I am loving this savory cupcake! Love olives and sundried tomatoes and herbs so it is a perfect combo for that tea time. I think you will like it, cream cheese doesn’t have much of a taste so you can basically mix it with just about anything you like. 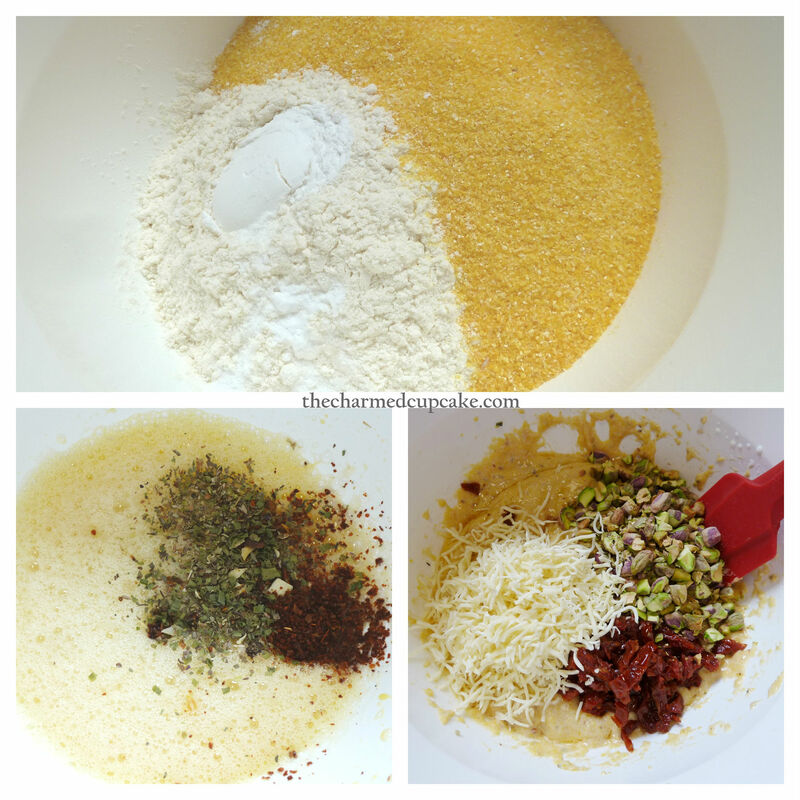 You could even do a garlic cream cheese mix or a garlic and olive cream cheese mix.